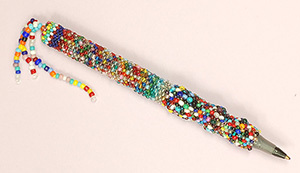 Create a colorful beaded pen cover using peyote stitch and left-over seed or Delica beads. Have fun with your color palette! Your cover can easily be transferred to another pen if ever need be. This class is suitable for all skill levels.